From Manu Garcia, a friend from IAC. Astronomy, everything you wanted to know about our local universe and never dared to ask. This image shows a light region 30,000 years simulation Renaissance, centered on a group of young galaxies generating radiation (white) and metals (green) while heating the surrounding gas. A halo of dark matter just outside this region hot forms three stars supermassive (box), each more than 1,000 times the mass of our sun. The stars quickly collapse into massive black holes, and eventually supermassive black holes, for thousands of millions of years. Credits: Advanced Visualization Laboratory, National Center for Supercomputing Applications. The light released around the first massive black holes in the universe is so intense that it is capable of reaching telescopes across the expanse of the universe. Incredibly, the light of the most distant black holes (or quasars) has been traveling toward us for more than 13 billion light years. However, we do not know how these monstrous black holes were formed. New research led by researchers at the Institute of Technology of Georgia, Dublin University , the State University of Michigan , the University of California at San Diego , the Supercomputing Center San Diego and IBM offers a new and extremely promising way to solve this cosmic enigma. The team showed that when galaxies are assembled extremely fast, sometimes violently, that can lead to the formation of very massive black holes. In these rare galaxies, normal star formation stops taking over the formation of black holes. The new study finds that massive black holes are formed in dense regions without stars that are growing rapidly, turning to the accepted belief that massive black hole formation was limited to regions bombarded by powerful radiation of nearby galaxies. The findings of the study based on simulation, published Jan. 23 in the journal Nature and backed by funding from the National Science Foundation, the European Union and NASA also found that massive black holes are much more common in the universe than than previously thought. collapse under their own gravity to form supermassive stars. Credit: John Wise, Georgia Institute of Technology. The key criteria to determine where massive black holes were formed during the infancy of the universe are related to the rapid growth of cloud pre-galactic gas which are the precursors of all current galaxies, which means that most of the supermassive black holes have a common origin that forms in this new scenario discovered, said John Wise , an associate professor Center for Relativistic Astrophysics School of Physics at Georgia Tech and corresponding author of the article. Dark matter collapses into halos that are the gravitational glue to all galaxies. The rapid early growth of these halos prevented the formation of stars that would have competed with black holes for gaseous matter to flow into the area. When the research team found these sites formation of black holes in the simulation, they felt puzzled at first, said John Regan, a researcher at the Center for Astrophysics and Relativity at the University of Dublin. The paradigm was previously accepted that black holes may be formed only when exposed to high levels of radiation nearby. This display was made from the region “RarePeak” Renaissance in the simulations that follow the formation of 800 galaxies in too dense region of the universe when it was only 270 million years. Blue and red are neutral (cold) and ionized gas (hot). White shows where galaxies are creating ultraviolet light, heating the surrounding intergalactic gas. This simulation was run on Blue Waters supercomputer at the National Center for Supercomputing Applications (NCSA). The above theory was based on the intense ultraviolet radiation from a nearby galaxy to inhibit the formation of stars in the halo forming a black hole, said Michael Norman, director of the Supercomputing Center San Diego at UC San Diego and one of the authors. “While UV radiation continues to be a factor, our work has shown that it is not the dominant factor, at least in our simulations,” he said. The research was based on the Renaissance Simulation suite, a set of 70 terabytes of data created in the supercomputer Blue Waters between 2011 and 2014 to help scientists understand how the universe evolved during its early years. To learn more about specific regions where it is likely that massive black holes are developed, researchers examined data from simulation and found ten halos specific dark matter that should have formed stars because of its mass but only contained a dense cloud of gas. Using TACC Stampede2 supercomputer, they returned to simulate two of these halos, each about 2,400 light-years in diameter, at a much higher resolution to understand the details of what was happening 270 million years after the Big Bang. Simulation of the Renaissance: Return to the normal region. Renaissance simulations are the most complete simulation of the early stages of the gravitational assembly pristine gas composed of hydrogen and helium and cold dark matter which leads to the formation of the first stars and galaxies. They use a technique known as adaptive mesh refinement to approach dense groups forming stars or black holes. In addition, covering a region of the early universe large enough to form thousands of objects, a requirement if you are interested in rare objects, as is the case here. “The high resolution, physical rich and the large sample collapsed halos were necessary to achieve this result,” Norman said. The improved resolution of the simulation carried out for two candidate regions allowed scientists to see the turbulence and gas inlet and clumps of matter formed as the precursors of the black hole began to condense and turn. Its growth rate was dramatic. Another aspect of the research is that the halos that give rise to black holes may be more common than previously believed. Future work with these simulations will analyze the life cycle of these galaxies forming massive black holes, studying the formation, growth and evolution of the first massive black holes over time. “Our next goal is to investigate the future evolution of these exotic objects. 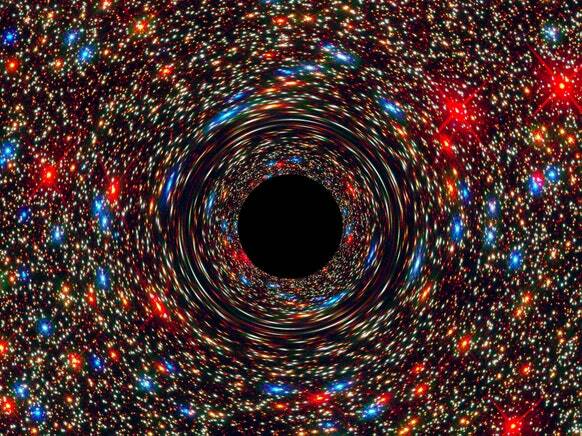 Where are these black holes today? Can we detect evidence of them in the local Universe or gravitational waves?” Asked Regan. For these new responses, the research team and others can return to the simulations. This research was supported by the National Science Foundation through the PHY-1430152, AST-1514700, AST-161 433 and OAC-1835213 grants, subsidies NASA NNX12AC98G, 147 NNX15AP39G and NNX17AG23G, and the theory of Hubble HST -AR-13261.01, -AR-14315.001 HST and HST-AR-14326. This project has received funding of research and innovation program Horizon 2020 the European Union under Grant Agreement No 699941 (Marie Sklodowska-Curie Actions – “SmartStars). The simulation was performed at the Blue Waters supercomputer operated by the National Center for Supercomputing Applications (NCSA) supported PRAC allocation by the NSF (ACI award-0,832,662, 1,238,993 and ACI ACI-1514580). Any opinions, findings and conclusions or recommendations expressed in this material are those of the authors and do not necessarily reflect the views of the sponsoring organizations. The Georgia Institute of Technology, commonly referred to as Georgia Tech, is a public research university and institute of technology located in the Midtown neighborhood of Atlanta, Georgia. It is a part of the University System of Georgia and has satellite campuses in Savannah, Georgia; Metz, France; Athlone, Ireland; Shenzhen, China; and Singapore. The school was founded in 1885 as the Georgia School of Technology as part of Reconstruction plans to build an industrial economy in the post-Civil War Southern United States. Initially, it offered only a degree in mechanical engineering. By 1901, its curriculum had expanded to include electrical, civil, and chemical engineering. In 1948, the school changed its name to reflect its evolution from a trade school to a larger and more capable technical institute and research university. Today, Georgia Tech is organized into six colleges and contains about 31 departments/units, with emphasis on science and technology. It is well recognized for its degree programs in engineering, computing, industrial administration, the sciences and design. Georgia Tech is ranked 8th among all public national universities in the United States, 35th among all colleges and universities in the United States by U.S. News & World Report rankings, and 34th among global universities in the world by Times Higher Education rankings. Georgia Tech has been ranked as the “smartest” public college in America (based on average standardized test scores). Student athletics, both organized and intramural, are a part of student and alumni life. The school’s intercollegiate competitive sports teams, the four-time football national champion Yellow Jackets, and the nationally recognized fight song “Ramblin’ Wreck from Georgia Tech”, have helped keep Georgia Tech in the national spotlight. Georgia Tech fields eight men’s and seven women’s teams that compete in the NCAA Division I athletics and the Football Bowl Subdivision. Georgia Tech is a member of the Coastal Division in the Atlantic Coast Conference. Lights out, windows darkened, doors closed. It’s not after hours at the Surface Assembly Lab (SAL), it’s just time for the first of LUX-ZEPLIN (LZ) dark matter detector’s on-site eye exam. LZ’s “eyes” are two massive arrays of photomultiplier tubes (PMTs), powerful light sensors that will detect any faint signals produced by dark matter particles when the experiment begins in 2020. The first of these arrays, which holds 241 PMTs, arrived at Sanford Underground Research Facility (Sanford Lab) in December. Now, researchers are testing the PMTs for the bottom array to make sure they are still in working condition after being transported from Brown University, where they were assembled. “These PMTs have already undergone rigorous testing, down to their individual components and this is the final test after transport to the site,” said Will Taylor, a graduate student at Brown University who has been working with the LZ collaboration since 2014. Once testing is completed, the bottom PMT array will be placed in the inner cryostat. The same process will be followed for the top array. The inner cryostat will be filled with xenon, both gaseous and liquid, and placed in the outer cryostat. Then, the entire detector will be submerged in the 72,000-gallon water tank in the Davis Campus on the 4850 Level of Sanford Lab. While researchers do expect a few PMTs to “blink out” over LZ’s five to six year lifetime, only the best of the best will make it into the detector. So, just how do researchers transform the SAL into an optometrist’s office? First, the array is placed in a special enclosure called the PALACE (PMT Array Lifting And Cleanliness Enclosure). There, the PMTs are shielded from light and dust. This enclosure also allows researchers access to the PMTs through a rotating window and to connect data collection systems to different sections of PMTs at a time. “At a normal temperature, particles vibrate around inside the PMTs. When this happens, it is possible for electrons to ‘jump off’ and produce a signal that PMTs will detect,” Taylor explained. While most of this “thermal noise” will vanish once the experiment is cooled to liquid xenon temperature (-148 °F), researchers want to ensure the PMT’s dark rate is at the lowest threshold possible before being installed in LZ. How much is too much noise? While a bit of noise (100-1000 events per second) is tolerable; rates closer to 10,000 events per second would be far too high, resulting in too many random signals that could overshadow WIMP signals during the experiment. “That’s why it is incredibly important to make sure each PMT has a low dark rate,” said Taylor. For the second test, called an “after-pulsing” test, researchers will flash a light, imperceptible to the human eye, at the PMTs. This test determines the health of each PMT’s internal vacuum. Why is this important? When light from a reaction inside the detector hits a photocathode of a PMT, an electron will be emitted. This single electron will be pulled through the PMT, hitting dynodes. Each time the electron hits an electrode, more electrons are emitted. This process continues, amplifying the original signal, turning the original electron into many, many, many electrons. To decrease particle “traffic,” each PMT has a vacuum. The vacuum ensures there are no gas particles present to interfere with the amplification process. If a vacuum is faulty, gas particles may get in the way and hit an electron. This would cause the gas particle to bounce away and set off a second pulse of electrons, amplifying a signal of its own. Rather than depriving the PMTs of light as they did during the dark test, researchers now createa signal of their own to measure the after-pulse. To do this, an LED is affixed to the inside of the PALACE. It is enough, however, for the PMT to detect it with a sizable initial pulse. Because researchers know exactly when the initial pulse was created, they can align their data to see when after-pulses occur and measure their strength. “This helps us see how healthy the vacuum is and determine if the PMT is fit for LZ,” Taylor said. After a week of testing, researchers have announced the bottom array has 20/20 vision. Data mining exercise reveals a whole new class of astronomical structure. The MACS J0717 galaxy cluster, 5.6 billion light years from Earth, as seen by NASA’s Chandra X-ray Observatory. A re-examination of data gathered a decade ago by astronomers using a 3.9-metre telescope [AAO Anglo Australian Telescope]located at the Siding Spring Observatory in the Australian state of New South Wales has revealed that the number of galaxy clusters in the universe has been underestimated by as much as a third. The finding is remarkable, because galaxy clusters – collections of individual galaxies bound together by gravity – are the largest structures in the universe and, by dint of containing billions or trillions of stars, relatively easy to see. The word “relatively”, in this case, is particularly apt, because stars, and whatever planets and other rocky bits and bobs accompany them, comprise only a very small fraction of any cluster’s mass. This was a discovery first made by American astronomer Fritz Zwicky in 1933, when he analysed the movements of stars within an enormous agglomeration called the COMA cluster and concluded that the mass of all the visible matter therein was insufficient to account for his findings. Something else – and something huge, at that – must have been in play. Fritz Zwicky discovered Dark Matter when observing the movement of the Coma Cluster. Scientists studying the cosmic microwave background hope to learn about more than just how the universe grew—it could also offer insight into dark matter, dark energy and the mass of the neutrino. And thus, the concept of dark matter entered the cosmological discourse. Current estimates suggest that in most galaxy clusters, the galaxies themselves – at least as defined by visible matter – comprise only 1% of the total mass. Hot gas clouds account for another 9%, and dark matter makes up the remaining 90%. The latest research, however, led by Luis Campusano from the Universidad de Chile, in Chile, suggests that in a substantial tranche of cases these percentages need to be revised, with the visible matter component declining even further. Campusano and colleagues revisited data gathered during a major galaxy redshift survey known as 2dFGRS, which was completed in 2003. The project looked at 191,440 galaxies. By carefully mining the information, and discarding some standard definitions, the astronomers identified 341 clusters – 87 of them previously unknown. The newly discovered groups, classified by the researchers as “late-type-rich clusters”, are described as being “high mass-to-light ratio systems”, which means that they contain fewer stars than other clusters. The stars are also less densely packed, meaning the galaxies contained in each cluster are less luminous than normal. Campusano and colleagues looked only at galaxies contained in the nearby universe – another highly relative term – but assume the results probably hold for the rest of the cosmos. The discovery – published in The Astrophysical Journal – seems likely to prompt a surge in newly focussed practical and theoretical astronomy. Not only are galaxy clusters about 33% more common than previously assumed, the astronomers report, but the newly defined “class of late-type-rich clusters is not predicted by current theory”. Our universe could be the mirror image of an antimatter universe extending backwards in time before the Big Bang. So claim physicists in Canada, who have devised a new cosmological model positing the existence of an “antiuniverse” [Physical Review Letters] which, paired to our own, preserves a fundamental rule of physics called CPT symmetry. The researchers still need to work out many details of their theory, but they say it naturally explains the existence of dark matter. Standard cosmological models tell us that the universe – space, time and mass/energy – exploded into existence some 14 billion years ago and has since expanded and cooled, leading to the progressive formation of subatomic particles, atoms, stars and planets. Instead, Turok and his Perimeter Institute colleague Latham Boyle set out to develop a model of the universe that can explain all observable phenomena based only on the known particles and fields. They asked themselves whether there is a natural way to extend the universe beyond the Big Bang – a singularity where general relativity breaks down – and then out the other side. “We found that there was,” he says. The answer was to assume that the universe as a whole obeys CPT symmetry. This fundamental principle requires that any physical process remains the same if time is reversed, space inverted and particles replaced by antiparticles. Turok says that this is not the case for the universe that we see around us, where time runs forward as space expands, and there’s more matter than antimatter. Instead, says Turok, the entity that respects the symmetry is a universe–antiuniverse pair. The antiuniverse would stretch back in time from the Big Bang, getting bigger as it does so, and would be dominated by antimatter as well as having its spatial properties inverted compared to those in our universe – a situation analogous to the creation of electron–positron pairs in a vacuum, says Turok. Turok, who also collaborated with Kieran Finn of Manchester University in the UK, acknowledges that the model still needs plenty of work and is likely to have many detractors. Indeed, he says that he and his colleagues “had a protracted discussion” with the referees reviewing the paper for Physical Review Letters [link is above] – where it was eventually published – over the temperature fluctuations in the cosmic microwave background. “They said you have to explain the fluctuations and we said that is a work in progress. Eventually they gave in,” he says. In very broad terms, Turok says, the fluctuations are due to the quantum-mechanical nature of space–time near the Big Bang singularity. While the far future of our universe and the distant past of the antiuniverse would provide fixed (classical) points, all possible quantum-based permutations would exist in the middle. He and his colleagues counted the instances of each possible configuration of the CPT pair, and from that worked out which is most likely to exist. “It turns out that the most likely universe is one that looks similar to ours,” he says. Turok adds that quantum uncertainty means that universe and antiuniverse are not exact mirror images of one another – which sidesteps thorny problems such as free will. But problems aside, Turok says that the new model provides a natural candidate for dark matter. This candidate is an ultra-elusive, very massive particle called a “sterile” neutrino hypothesized to account for the finite (very small) mass of more common left-handed neutrinos. According to Turok, CPT symmetry can be used to work out the abundance of right-handed neutrinos in our universe from first principles. By factoring in the observed density of dark matter, he says that quantity yields a mass for the right-handed neutrino of about 5×108 GeV – some 500 million times the mass of the proton. Turok describes that mass as “tantalizingly” similar to the one derived from a couple of anomalous radio signals spotted by the Antarctic Impulsive Transient Antenna (ANITA). The balloon-borne experiment, which flies high over Antarctica, generally observes cosmic rays travelling down through the atmosphere. However, on two occasions ANITA appears to have detected particles travelling up through the Earth with masses between 2 and 10×108 GeV. Given that ordinary neutrinos would almost certainly interact before getting that far, Thomas Weiler of Vanderbilt University and colleagues recently proposed that the culprits were instead decaying right-handed neutrinos [Letters in High Energy Physics]. PhysicsWorld is a publication of the Institute of Physics. The Institute of Physics is a leading scientific society. We are a charitable organisation with a worldwide membership of more than 50,000, working together to advance physics education, research and application. We engage with policymakers and the general public to develop awareness and understanding of the value of physics and, through IOP Publishing, we are world leaders in professional scientific communications. Physicists are remarkably frank: they don’t know what dark matter is made of. “We’re all scratching our heads,” says physicist Reina Maruyama of Yale University. “The gut feeling is that 80 percent of it is one thing, and 20 percent of it is something else,” says physicist Gray Rybka of the University of Washington. Why does he think this? It’s not because of science. “It’s a folk wisdom,” he says. Peering through telescopes, researchers have found a deluge of evidence for dark matter. Galaxies, they’ve observed, rotate far faster than their visible mass allows. The established equations of gravity dictate that those galaxies should fall apart, like pieces of cake batter flinging off a spinning hand mixer. The prevailing thought is that some invisible material—dark matter—must be holding those galaxies together. Observations suggest that dark matter consists of diffuse material “sort of like a cotton ball,” says Maruyama, who co-leads a dark matter research collaboration called COSINE-100. Here on Earth, though, clues are scant. Given the speed that galaxies rotate, dark matter should make up 85 percent of the matter in the universe, including on our provincial little home planet. But only one experiment, a detector in Italy named DAMA, has ever registered compelling evidence of the stuff on Earth. “There have been hints in other experiments, but DAMA is the only one with robust signals,” says Maruyama, who is unaffiliated with the experiment. For two decades, DAMA has consistently measured a varying signal that peaks in June and dips in December. The signal suggests that dark matter hits Earth at different rates corresponding to its location in its orbit, which matches theoretical predictions. But the search has yielded few other promising signals. This year, several detectors reported null findings. XENON1T, a collaboration whose detector is located in the same Italian lab as DAMA, announced they hadn’t found anything this May. Panda-X, a China-based experiment, published in July that they also hadn’t found anything. Even DAMA’s results have been called into question: In December, Maruyama’s team published that their detector, a South-Korea based DAMA replica made of some 200 pounds of sodium iodide crystal, failed to reproduce its Italian predecessor’s results. These experiments are all designed to search for a specific dark matter candidate, a theorized class of particles known as Weakly Interacting Massive Particles, or WIMPs, that should be about a million times heavier than an electron. WIMPs have dominated dark matter research for years, and Miguel Zumalacárregui is tired of them. About a decade ago, when Zumalacárregui was still a PhD student, WIMP researchers were already promising an imminent discovery. “They’re just coming back empty-handed,” says Zumalacárregui, now an astrophysicist at the University of California, Berkeley. He’s not the only one with WIMP fatigue. “In some ways, I grew tired of WIMPs long ago,” says Rybka. Rybka is co-leading an experiment that is pursuing another dark matter candidate: a dainty particle called an axion, roughly a billion times lighter than an electron and much lighter than the WIMP. In April, the Axion Dark Matter Experiment collaboration announced that they’d finally tweaked their detector to be sensitive enough to detect axions. He is betting on axions because they would also resolve a piece of another long-standing puzzle in physics: exactly how quarks bind together to form atomic nuclei. “It seems too good to just be a coincidence, that this theory from nuclear physics happens to make the right amount of dark matter,” says Rybka. As Rybka’s team sifts through earthly data for signs of axions, astrophysicists look to the skies for leads. In a paper published in October, Zumalacárregui and a colleague ruled out an old idea that dark matter was mostly made of black holes. They reached this conclusion by looking through two decades of supernovae observations. When a supernova passes behind a black hole, the black hole’s gravity bends the supernova’s light to make it appear brighter. The brighter the light, the more massive the black hole. So by tabulating the brightness of hundreds of supernovae, they calculated that black holes that are at least one-hundredth the size of the sun can account for up to 40 percent of dark matter, and no more. Farnes is trying to fill that void. In a paper published in December [Astronomy and Astrophysics], he proposed that dark matter could be a weird fluid that moves toward you if you try to push it away. He created a simplistic simulation of the universe containing this fluid and found that it could potentially also explain why the universe is expanding, another long-standing mystery in physics. He is careful to point out that his ideas are speculative, and it is still unclear whether they are consistent with prior telescope observations and dark matter experiments. WIMPs could still be dark matter as well, despite enthusiasm for new approaches. Maruyama’s Korean experiment has ruled out “the canonical, vanilla WIMP that most people talk about,” she says, but lesser-known WIMP cousins are still on the table. It’s important to remember, as physicists clutch onto their favorite theories—regardless of how refreshing they are—that they need corroborating data. “The universe doesn’t care what is beautiful or elegant,” says Farnes. Nor does it care about what’s trendy. Guys, the universe might be really uncool. With main components arriving, researchers have begun the meticulous work of piecing together LUX-ZEPLIN on the 4850 Level. As they peer down into the LUX-ZEPLIN (LZ) water tank from the work deck above, researchers and engineers can finally see the assembly process in full swing. Science and Technology Facilities Council’s Pawel Majewski focuses on the cryostat installation. He recently returned to Sanford Underground Research Facility (Sanford Lab) after nearly half a year away and is thrilled with what he’s seeing. The LZ experiment. LZ (LUX-ZEPLIN) will be 30 times larger and 100 times more sensitive than its predecessor, the Large Underground Xenon experiment. The race to build the most sensitive direct-detection dark matter experiment got a bit more competitive with the Department of Energy’s approval of a key construction milestone on Feb.9. LUX-ZEPLIN (LZ), a next-generation dark matter detector, will replace the Large Underground Xenon (LUX) experiment. The Critical Decision 3 (CD-3) approval puts LZ on track to begin its deep-underground hunt for theoretical particles known as WIMPs in 2020. “We got a strong endorsement to move forward quickly and to be the first to complete the next-generation dark matter detector,” said Murdock “Gil” Gilchriese, LZ project director and a physicist at Lawrence Berkeley National Laboratory, the lead lab for the project. The LZ collaboration includes approximately 220 participating scientists and engineers representing 38 institutions around the world. The fast-moving schedule allows the U.S. to remain competitive with similar next-generation dark matter experiments planned in Italy and China. WIMPs (weakly interacting massive particles) are among the top prospects for explaining dark matter, which has only been observed through its gravitational effects on galaxies and clusters of galaxies. Believed to make up nearly 80 percent of all the matter in the universe, this “missing mass” is considered to be one of the most pressing questions in particle physics. LZ will be at least 100 times more sensitive to finding signals from dark matter particles than its predecessor, the Large Underground Xenon experiment (LUX), which was decommissed last year to make way for LZ. 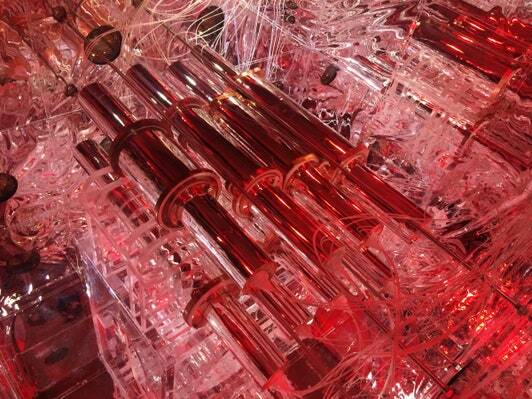 The new experiment will use 10 metric tons of ultra-purified liquid xenon, to tease out possible dark matter signals. Xenon, in its gas form, is one of the rarest elements in Earth’s atmosphere. A planned upgrade to the current XENON1T experiment at National Institute for Nuclear Physics’ Gran Sasso Laboratory (the XENONnT experiment) in Italy, and China’s plans to advance the work on PandaX-II, are also slated to be leading-edge underground experiments that will use liquid xenon as the medium to seek out a dark matter signal. Both of these projects are expected to have a similar schedule and scale to LZ, though LZ participants are aiming to achieve a higher sensitivity to dark matter than these other contenders. 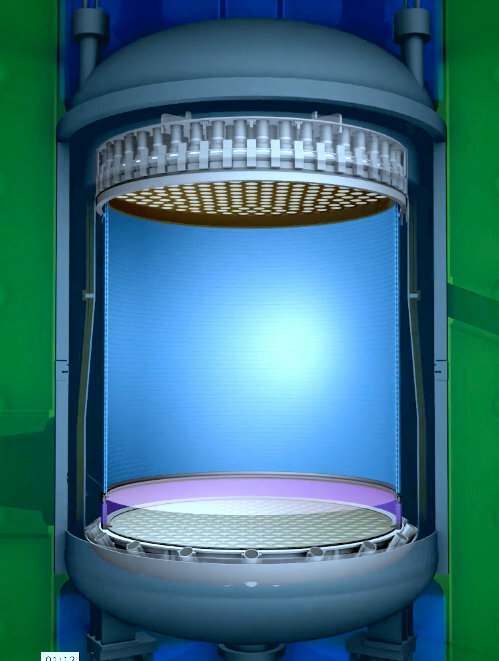 LZ is designed so that if a dark matter particle collides with a xenon atom, it will produce a prompt flash of light followed by a second flash of light when the electrons produced in the liquid xenon chamber drift to its top. The light pulses, picked up by a series of about 500 light-amplifying tubes lining the massive tank—over four times more than were installed in LUX—will carry the telltale fingerprint of the particles that created them. Daniel Akerib and Thomas Shutt are leading the LZ team at SLAC National Accelerator Laboratory, which includes an effort to purify xenon for LZ by removing krypton, an element that is typically found in trace amounts with xenon after standard refinement processes. 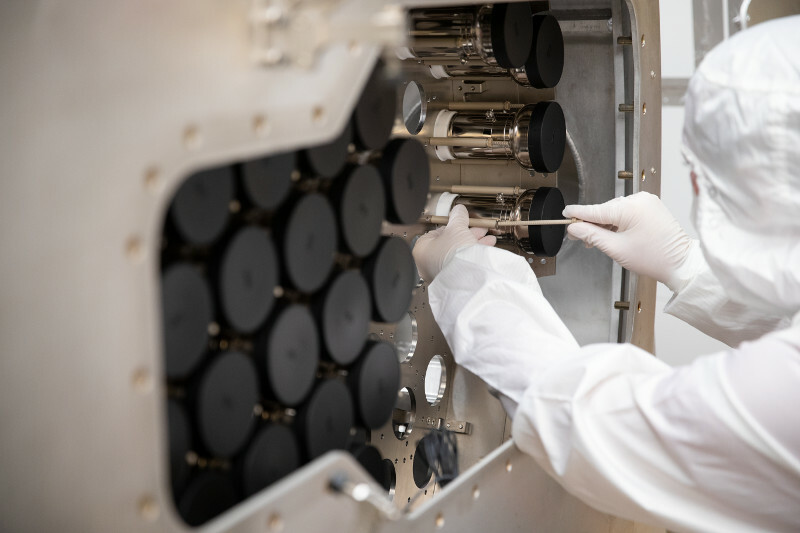 “We have already demonstrated the purification required for LZ and are now working on ways to further purify the xenon to extend the science reach of LZ,” Akerib said. SLAC and Berkeley Lab collaborators are also developing and testing hand-woven wire grids that draw out electrical signals produced by particle interactions in the liquid xenon tank. Full-size prototypes will be operated later this year at a SLAC test platform. “These tests are important to ensure that the grids don’t produce low-level electrical discharge when operated at high voltage, since the discharge could swamp a faint signal from dark matter,” said Shutt. Hugh Lippincott, a Wilson Fellow at Fermi National Accelerator Laboratory (Fermilab) and the physics coordinator for the LZ collaboration, said, “Alongside the effort to get the detector built and taking data as fast as we can, we’re also building up our simulation and data analysis tools so that we can understand what we’ll see when the detector turns on. We want to be ready for physics as soon as the first flash of light appears in the xenon.” Fermilab is responsible for implementing key parts of the critical system that handles, purifies, and cools the xenon. All of the components for LZ are painstakingly measured for naturally occurring radiation levels to account for possible false signals coming from the components themselves. A dust-filtering cleanroom is being prepared for LZ’s assembly and a radon-reduction building is under construction at the South Dakota site—radon is a naturally occurring radioactive gas that could interfere with dark matter detection. These steps are necessary to remove background signals as much as possible. 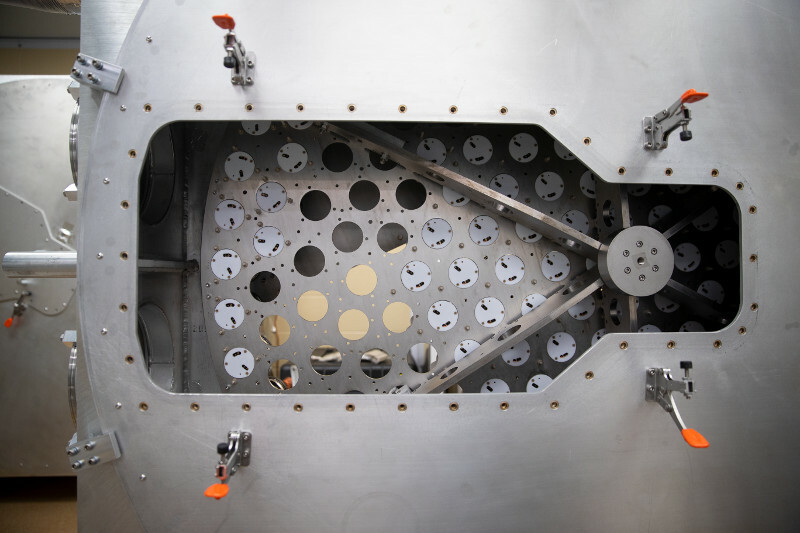 The vessels that will surround the liquid xenon, which are the responsibility of the U.K. participants of the collaboration, are now being assembled in Italy. They will be built with the world’s most ultra-pure titanium to further reduce background noise. The cleanrooms will be in place by June, Gilchriese said, and preparation of the cavern where LZ will be housed is underway at SURF. Onsite assembly and installation will begin in 2018, he added, and all of the xenon needed for the project has either already been delivered or is under contract. Xenon gas, which is costly to produce, is used in lighting, medical imaging and anesthesia, space-vehicle propulsion systems, and the electronics industry. UK scientists, who make up about one-quarter of the LZ collaboration, are contributing hardware for most subsystems. Henrique Araújo, from Imperial College London, said, “We are looking forward to seeing everything come together after a long period of design and planning. Kelly Hanzel, LZ project manager and a Berkeley Lab mechanical engineer, added, “We have an excellent collaboration and team of engineers who are dedicated to the science and success of the project.” The latest approval milestone, she said, “is probably the most significant step so far,” as it provides for the purchase of most of the major components in LZ’s supporting systems. Brown University researchers have assembled two massive arrays of photomultiplier tubes, powerful light sensors that will serve as the “eyes” for the LUX-ZEPLIN dark matter detector, which will start its search for dark matter particles in 2020. The LUX-ZEPLIN (LZ) dark matter detector, which will soon start its search for the elusive particles thought to account for a majority of matter in the universe, had the first of its “eyes” delivered late last week. The first of two large arrays of photomultiplier tubes (PMTs) — powerful light sensors that can detect the faintest of flashes — arrived last Thursday at the Sanford Underground Research Facility (SURF) in Lead, South Dakota, where LZ is scheduled to begin its dark matter search in 2020. The second array will arrive in January. When the detector is completed and switched on, the PMT arrays will keep careful watch on LZ’s 10-ton tank of liquid xenon, looking for the telltale twin flashes of light produced if a dark matter particle bumps into a xenon atom inside the tank. The two arrays, each about 5 feet in diameter and holding a total of 494 PMTs, were shipped to South Dakota via truck from Providence, Rhode Island, where a team of researchers and technicians from Brown University spent the past six months painstakingly assembling them. The Brown team has worked with researchers and engineers from the U.S. Department of Energy’s Lawrence Berkeley National Laboratory (Berkeley Lab) and from Imperial College London to design, procure, test, and assemble all of the components of the array. Testing of the PMTs, which are manufactured by the Hamamatsu Corporation in Japan, was performed at Brown and at Imperial College “The PMTs have already qualified for significant air miles, even before they started their 2,000-mile journey by road from Rhode Island to South Dakota,” Gaitskell said. “The PMTs have already qualified for significant air miles, even before they started their 2,000-mile journey by road from Rhode Island to South Dakota,” Gaitskell said. Nobody knows exactly what dark matter is. Scientists can see the effects of its gravity in the rotation of galaxies and in the way light bends as it travels across the universe, but no one has directly detected a dark matter particle. The leading theoretical candidate for a dark matter particle is the WIMP, or weakly interacting massive particle. WIMPs can’t be seen because they don’t absorb, emit or reflect light. And they interact with normal matter only on very rare occasions, which is why they’re so hard to detect even when millions of them may be traveling through the Earth and everything on it each second. The LZ experiment, a collaboration of more than 250 scientists worldwide, aims to capture one of those fleetingly rare WIMP interactions, and thereby characterize the particles thought to make up more than 80 percent of the matter in the universe. The detector will be the most sensitive ever built, 50 times more sensitive than the LUX detector, which wrapped up its dark matter search at SURF in 2016. The PMT arrays are a critical part of the experiment. Each PMT is a six-inch-long cylinder that is roughly the diameter of a soda can. To form arrays large enough to monitor the entire LZ xenon target, hundreds of PMTs are assembled together within a circular titanium matrix. The array that will sit on top of the xenon target has 253 PMTs, while the lower array has 241. PMTs are designed to amplify weak light signals. When individual photons (particles of light) enter a PMT, they strike a photocathode. If the photon has sufficient energy, it causes the photocathode to eject one or more electrons. Those electrons strike then an electrode, which ejects more electrons. By cascading through a series of electrodes the original signal is amplified by over a factor of a million to create a detectable signal. LZ’s PMT arrays will need every bit of that sensitivity to catch the flashes associated with a WIMP interaction. The photons are produced by what’s known as a nuclear recoil event, which produces two distinct flashes. The first comes at the moment a WIMP bumps into a xenon nucleus. The second, which comes a few hundred microseconds afterward, is produced by the ricochet of the xenon atom that was struck. It bounces into the atoms surrounding it, which knocks a few electrons free. The electrons are then drifted by an electric field to the top of the tank, where they reach a thin layer of xenon gas that converts them into light. In order for those tiny flashes to be distinguishable from unwanted background events, the detector needs to be protected from cosmic rays and other kinds of radiation, which also cause liquid xenon to light up. That’s why the experiment takes place underground at SURF, a former gold mine, where the detector will be shielded by about a mile of rock to limit interference. The need to limit interference is also the reason that the Brown University team was obsessed with cleanliness while they assembled the arrays. The team’s main enemy was plain old dust. Each dust particle carries a minuscule amount of radioactive uranium and thorium decay products. The radiation is vanishingly small and poses no threat to people, but too many of those specks inside the LZ detector could be enough to interfere with a WIMP signal. In fact, the dust budget for the LZ experiment calls for no more than one gram of dust in the entire 10-ton instrument. Because of all their nooks and crannies, the PMT arrays could be significant dust contributors if pains were not taken to keep them clean throughout construction. The Brown team performed most of its work in a “class 1,000” cleanroom, which allows no more than 1,000 microscopic dust particles per cubic foot of space. And within that cleanroom was an even more pristine space that the team dubbed “PALACE (PMT Array Lifting And Commissioning Enclosure).” PALACE was essentially an ultraclean exoskeleton where much of the actual array assembly took place. PALACE was a “class 10” space — no more than 10 dust particles bigger than one hundredth the width of a human hair per cubic foot. But the radiation concerns didn’t stop at dust. Before assembly of the arrays began, the team prescreened every part of every PMT tube to assess radiation levels. The team is hopeful that all the work contributed over the past six months will pay dividends when LZ starts its WIMP search. Given the major increase in dark matter search sensitivity that the LUX-ZEPLIN detector can deliver compared to previous experiments, the team hopes that this detector will finally identify and characterize the vast sea of stuff that surrounds us all. So far, the dark stuff has remained maddeningly elusive. 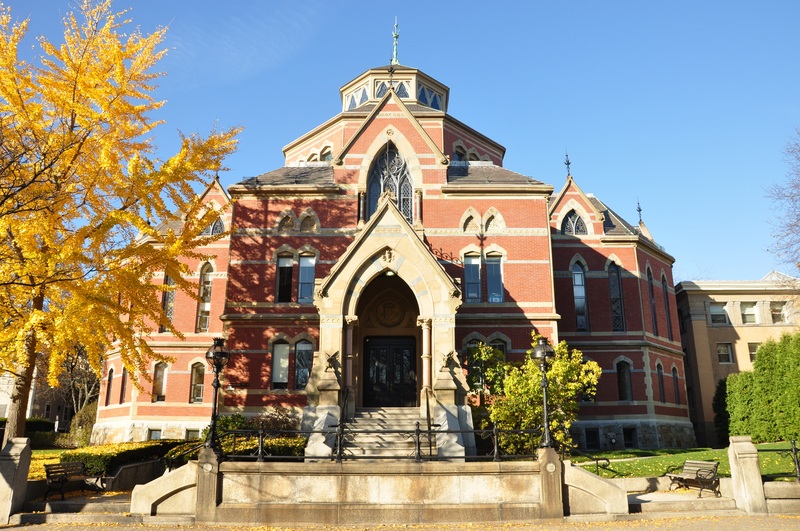 Located in historic Providence, Rhode Island and founded in 1764, Brown University is the seventh-oldest college in the United States. Brown is an independent, coeducational Ivy League institution comprising undergraduate and graduate programs, plus the Alpert Medical School, School of Public Health, School of Engineering, and the School of Professional Studies. With its talented and motivated student body and accomplished faculty, Brown is a leading research university that maintains a particular commitment to exceptional undergraduate instruction. Brown’s vibrant, diverse community consists of 6,000 undergraduates, 2,000 graduate students, 400 medical school students, more than 5,000 summer, visiting and online students, and nearly 700 faculty members. Brown students come from all 50 states and more than 100 countries. Undergraduates pursue bachelor’s degrees in more than 70 concentrations, ranging from Egyptology to cognitive neuroscience. Anything’s possible at Brown—the university’s commitment to undergraduate freedom means students must take responsibility as architects of their courses of study. Gazing across 300 million light-years into a monstrous city of galaxies, astronomers have used NASA’s Hubble Space Telescope to do a comprehensive census of some of its most diminutive members: a whopping 22,426 globular star clusters found to date. The survey, published in the November 9, 2018, issue of The Astrophysical Journal, will allow for astronomers to use the globular cluster field to map the distribution of matter and dark matter in the Coma galaxy cluster, which holds over 1,000 galaxies that are packed together. Among the earliest homesteaders of the universe, globular star clusters are snow-globe-shaped islands of several hundred thousand ancient stars. They are integral to the birth and growth of a galaxy. About 150 globular clusters zip around our Milky Way galaxy, and, because they contain the oldest known stars in the universe, were present in the early formative years of our galaxy. Some of the Milky Way’s globular clusters are visible to the naked eye as fuzzy-looking “stars.” But at the distance of the Coma cluster, its globulars appear as dots of light even to Hubble’s super-sharp vision. The survey found the globular clusters scattered in the space between the galaxies. They have been orphaned from their home galaxy due to galaxy near-collisions inside the traffic-jammed cluster. Hubble revealed that some globular clusters line up along bridge-like patterns. This is telltale evidence for interactions between galaxies where they gravitationally tug on each other like pulling taffy. Astronomer Juan Madrid of the Australian Telescope National Facility in Sydney, Australia first thought about the distribution of globular clusters in Coma when he was examining Hubble images that show the globular clusters extending all the way to the edge of any given photograph of galaxies in the Coma cluster. To fill in the survey gaps, Madrid and his team painstakingly pulled numerous Hubble images of the galaxy cluster taken from different Hubble observing programs. These are stored in the Space Telescope Science Institute’s Mikulski Archive for Space Telescopes in Baltimore, Maryland. He assembled a mosaic of the central region of the cluster, working with students from the National Science Foundation’s Research Experience for Undergraduates program. “This program gives an opportunity to students enrolled in universities with little or no astronomy to gain experience in the field,” Madrid said. The team developed algorithms to sift through the Coma mosaic images that contain at least 100,000 potential sources. The program used globular clusters’ color (dominated by the glow of aging red stars) and spherical shape to eliminate extraneous objects – mostly background galaxies unassociated with the Coma cluster. Though Hubble has superb detectors with unmatched sensitivity and resolution, their main drawback is that they have tiny fields of view. “One of the cool aspects of our research is that it showcases the amazing science that will be possible with NASA’s planned Wide Field Infrared Survey Telescope (WFIRST) that will have a much larger field of view than Hubble,” said Madrid. The Hubble Space Telescope is a project of international cooperation between NASA and the European Space Agency. NASA’s Goddard Space Flight Center manages the telescope. The Space Telescope Science Institute (STScI), is a free-standing science center, located on the campus of The Johns Hopkins University and operated by the Association of Universities for Research in Astronomy (AURA) for NASA, conducts Hubble science operations. Predicted by Einstein and discovered in 1979, gravitational lensing helps astrophysicists understand the evolving shape of the universe. On March 29, 1979, high in the Quinlan Mountains in the Tohono O’odham Nation in southwestern Arizona, a team of astronomers at Kitt Peak National Observatory was scanning the night sky when they saw something curious in the constellation Ursa Major: two massive celestial objects called quasars with remarkably similar characteristics, burning unusually close to one another. The astronomers—Dennis Walsh, Bob Carswell and Ray Weymann—looked again on subsequent nights and checked whether the sight was an anomaly caused by interference from a neighboring object. It wasn’t. Spectroscopic analysis confirmed the twin images were actually both light from a single quasar 8.7 billion light-years from Earth. It appeared to telescopes on Kitt Peak to be two bodies because its light was distorted by a massive galaxy between the quasar and Earth. The team had made the first discovery of a gravitational lens. Since then, gravitational lenses have given us remarkable images of the cosmos and granted cosmologists a powerful means to unravel its mysteries. “Lensing is one of the primary tools we use to learn about the evolution of the universe,” says Mandeep Gill, an astrophysicist at Kavli Institute for Particle Astrophysics and Cosmology (KIPAC), Stanford. By observing the gravitational lensing and redshift of galaxy clusters, he explains, cosmologists can determine both the matter content of the universe and the speed at which the universe is expanding. Gravitational lensing was predicted by Einstein’s theory of general relativity. General relativity posited that massive objects like the sun actually bend the fabric of spacetime around them. Like a billiard ball sinking into a stretched-out rubber sheet, a massive object creates a depression around it; it’s called a “gravity well.” Light passing through a gravity well bends with its curves. Most gravitational lensing events are not so dramatic. Any mass will curve the spacetime around it, causing slight distortions to passing light. While this weak lensing is not apparent from a single observation, taking an average from many light sources allows observers to detect weak lensing effects as well. “A cosmic shear measurement is incredibly meticulous as the effect is so small, but it holds a wealth of information about how the structure in the universe has evolved with time,” says Alexandra Amon, an observational cosmologist at KIPAC who specializes in weak lensing. Strong and weak gravitational lensing are both important tools in the study of dark matter and dark energy, the invisible stuff that together make up 96 percent of the universe. There is not enough visible mass in the universe to cause all of the gravitational lensing that astronomers see; scientists think most of it is caused by invisible dark matter. And how all of that matter moves and changes over time is thought to be affected by a mysterious “force” (scientists aren’t really sure what it is) pushing our universe to expand at an accelerating pace: dark energy. Studying gravitational lensing can help astrophysicists track the universe’s growth. The Dark Energy Survey is one of several experiments using gravitational lensing to study dark matter and dark energy. DES scientists are using the Cerro Tololo Inter-American Observatory in Chile to perform a 5000-square-degree survey of the southern sky. Along with other measurements, DES is searching for weak lensing and cosmic shear effects of dark matter on distant objects. The Large Synoptic Survey Telescope, currently under construction in Chile, will also assess how dark matter is distributed in the universe by looking for gravitational lenses, among other things. Astronomers expect LSST to find 100 times more galaxy-scale strong gravitational lens systems than are currently known. LSST telescope, currently under construction on the El Peñón peak at Cerro Pachón Chile, a 2,682-meter-high mountain in Coquimbo Region, in northern Chile, alongside the existing Gemini South and Southern Astrophysical Research Telescopes. Surprisingly, these enormous studies of cosmic distortions may bring the make-up of our universe into focus. Symmetry is a joint Fermilab/SLAC publication. Researchers developed a mathematical model describing motion of dark matter particles inside the smallest galaxy halos. They observed that over time, the dark matter may form spherical droplets of quantum condensate. Previously this was considered impossible, as fluctuations of the gravity field produced by dark matter particles were ignored. The study is published in Physical Review Letters. Dark matter is a hypothetical form of matter that does not emit electromagnetic radiation. This property hinders dark matter searches and makes it hard even to prove its existence. The speed of dark matter particles is low, which is why they are retained by galaxies. They interact with each other and with the ordinary matter so weakly that only their gravity field can be sensed, otherwise the dark matter does not manifest itself in any way. Each galaxy is surrounded by a dark matter shell (halo) of much larger size and mass. Most cosmologists believe that dark matter particles have large mass, hence their speed is high. Yet, back in the 1980s it was realized that under special conditions these particles may be produced in the early Universe with almost zero speed, regardless of their mass. They might also be very light. As a consequence, the distances at which the quantum nature of these particles becomes apparent can be huge. Instead of the nanometer scales that are usually required to observe quantum phenomena in laboratories, the “quantum” scale for such particles may be comparable to the size of the central part of our galaxy. The researchers observed that the dark matter particles, if they are bosons with sufficiently small mass, may form a Bose-Einstein condensate in the small galaxy halos or in even smaller substructures due to their gravitational interactions. Such substructures include halos of dwarf galaxies – systems of several billion stars bound together by gravitational forces, and miniclusters – very small systems formed only by dark matter. The Bose-Einstein condensate is a state of quantum particles in which they all occupy the lowest energy level, having the smallest energy. The Bose-Einstein condensate can be produced in the lab at low temperatures from ordinary atoms. This state of matter exhibits unique properties, such as superfluidity: the ability to pass through tiny cracks or capillaries without friction. Light dark matter in the galaxy has low speed and huge concentration. Under these conditions, it should eventually form a Bose-Einstein condensate. But in order for this to happen, dark matter particles must interact with each other, while as far as we know, they interact only gravitationally. “In our work, we simulated motion of a quantum gas of light gravitationally interacting dark matter particles. We started from a virialized state with maximal mixing, which is kind of opposite to the Bose-Einstein condensate. After a very long period, 100,000 times longer than the time needed for a particle to cross the simulation volume, the particles spontaneously formed a condensate, which immediately shaped itself into a spherical droplet, a Bose star, under the effect of gravity,” said one of the authors, Dmitry Levkov, Ph.D. in Physics, Senior Researcher at the Institute for Nuclear Research of the Russian Academy of Sciences. Dr. Levkov and his colleagues, Alexander Panin and Igor Tkachov from the Institute for Nuclear Physics of the Russian Academy of Sciences, concluded that Bose-Einstein condensate may form in the centres of halos of dwarf galaxies in a time smaller than the lifetime of the Universe. This means that Bose stars could populate them now. The authors were the first who saw the formation of the Bose-Einstein condensate from light dark matter in computer simulations. In previous numerical studies, the condensate was already present in the initial state, and Bose stars arose from it. According to one hypothesis, the Bose condensate could have formed in the early Universe long before the formation of galaxies or miniclusters, but reliable evidence for that is currently lacking. The authors demonstrated that the condensate is formed in the centres of small halos, and they plan to investigate condensation in the early Universe in further studies. The scientists pointed out that the Bose stars may produce Fast Radio Bursts that currently have no quantitative explanation. Light dark matter particles called “axions” interact with electromagnetic field very weakly and can decay into radiophotons. This effect is vanishingly small, but inside the Bose star it may be resonantly amplified like in a laser and could lead to giant radio bursts. “The next obvious step is to predict the number of the Bose stars in the Universe and calculate their mass in models with light dark matter,” concluded Dmitry Levkov. EurekAlert!, the premier online news source focusing on science, health, medicine and technology, is a free service for reporters worldwide. Since 1996, EurekAlert! has served as the leading destination for scientific organizations seeking to disseminate news to reporters and the public. Today, thousands of reporters around the globe rely on EurekAlert! as a source of ideas, background information, and advance word on breaking news stories. More than 1,000 peer-reviewed journals, universities, medical centers, government agencies and public relations firms have used EurekAlert! to distribute their news. EurekAlert! is an authoritative and comprehensive research news source for journalists all over the world.